Draghi wants more power to Brussels, that’s quite clear from the interview. REPLY: The new push in Europe is to rush Federalization to “save” the euro, which is doomed anyway because of its fractured design. The real self-interest here is to save the jobs in Brussels. The birth of the Euro was accompanied with an oath that this would never be the federalization of Europe. Politicians simply see only their own power and we are rapidly going down the drain on the entire global economy that these people are destroying to retain their own personal power. There is no one-world government agenda here for that would require surrendering Brussels to some other entity. That is the way conspiracies really function by having people exaggerate a trend to something absurd and then just the federalization of Europe seems better that the world. They are all pursuing just their own self-interest and this is the global agenda of sharing info to hunt down loose change everywhere and the elimination of all cash to then force capital into banks that they can grab when they desire. Fortunately for them, 90% of the people are blind, and 3% are the real conspiracy crowd so that leave only about 7% that see the train coming down the track for what it is – a train. Welcome the Federalization of Europe – one state – one union. Brussels can only see their failure is the lack of power, not because they do not know how to manage anything. Mario Draghi rarely gives interviews. Hitherto he operated mainly large business newspapers and German media. This is his first interview with a Dutch newspaper. Brussels should gain more power. That is the only way to ensure the future of the euro and leave the crisis finally behind us. That argues President Mario Draghi of the European Central Bank, in an exclusive interview with this newspaper. He will take clear from the statement of the VVD and some other politicians that the euro project is finished. The worst of the crisis has been contained but much aftercare is still needed. The great imbalance between the euro countries is caused by a lack of structural reforms in some countries. The next step is to bring structural reforms under a common discipline. It is good that we have stricter fiscal rules and a banking union. But we’re not there yet, he says. “There is still need for a perfect monetary union to make.” Economic policy is not only a national issue, there should be more unified direction in which policies are needed. This means that Europe gets something to say about, for example, the Dutch mortgage. Draghi calls for more structural reforms in some countries. He mentions no names, but referring to France and Italy, two large and important euro countries are hopelessly behind on the necessary reforms. Italy also sighs under a debt of 130 percent of the national income. The ECB president understands the Dutch worry that they pay for the mistakes of southern Europe. “I see that conflict.” Yet he advocates solidarity. This means European interest rates are low to help the south. Ultimately, the North should benefit from that. According to Draghi, the euro area is now on the right track. Low inflation is a major plus, purchasing power is enhanced by it. Downside is that the fear of deflation slows the economy and that debts are hardly less, because they are not “eaten” by inflation. 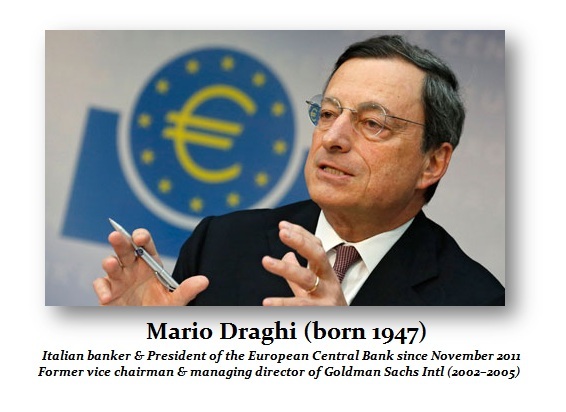 Mario Draghi is one of the key players in the euro crisis. The panic about the coin is gone, but his troubles are not, so experiences the President of the European Central Bank. Why isn’t the European economy picking up pace? And why do we in the North pay for the Soutch? “Dutch do have difficulty to pay for the Greeks but not they have to pay for the other Dutch. When Mario Draghi took office in November 2011 as the new president of the European Central Bank, he stepped into the eye of the hurricane. The eurozone was in deep trouble. After financial misery in Greece, Portugal and Ireland also large countries like Spain and Italy were threatening to fall. The panic was large, politicians and investors. He wants to join in the Dutch debate about the euro. He can’t do much with politicians who promise any cloud cuckoo land outside the European currency. “According to some, we must go back in time, thirty, forty years. I prefer to move forward. “And that means also build on the currency union, because it is not finished yet. Dijsselbloem minister said recently that the crisis is over. What do you think? You define recovery anything above zero? Because of the turmoil in Iraq oil prices shoot up again. How risky is it? I hope winters are not as mild as they were because there were less gas sales in the Netherlands. Compared to the U.S. economy in Europe is all rather meager. And that happened all three at the same time? “No, we responded especially to the first two. We have not seen deflation in the euro area in the sense that prices fall across the board. That households and businesses postpone spending and investments, waiting for lower prices. We see that the low inflation persists for a long time. If it takes too long, it makes adjustment in the crisis countries difficult. With low inflation, wages in these countries in absolute terms should really go down to improve their economic situation in terms of competition. “Does their competitive position also plays a role in that debt pressures heavier at low inflation? Private debt and public debt? Low interest rate is harmful for savers and pensions. What is your response to that concern? How long will interest rates remain low? When in the spring of 2015 U.S. will raise interest rates again, Europe will have to wait until the spring of 2017? “We’ll see, but the extension to the end of 2016 is a signal. Moreover, the U.S. growth in the first quarter significantly revised downwards. Do you understand that people in the north have the feeling that they have to pay for the mistakes of the south? Because it is a political union. Can Greece ever repay you? The ECB has taken many measures except quantitative easing, buying up bonds. What needs to happen before you decides to do this? “Is it legally possible to buy government bonds? There is, after all, still a lawsuit. You were very pleased with the unanimous decision on June 5. Can unanimity also be reached on quantitative easing? Or were you relieved that you just had to promise it but not execute it? “The banking union is a huge step forward for a more perfect union currency. The crisis shows that the economic policies of one country clearly has implications for other countries. Economic policy is not merely a matter of national competence. Fiscal policy has a certain common discipline. But the great imbalance between euro countries is caused by a lack of structural reforms in some countries. The next step is to also transform structural reforms into one common discipline. “The economic crisis and unemployment are the result of a very serious financial crisis, and partly of the wrong economic policy. The euro has perhaps masked it, but not caused it. We need the monetary union to escape from the crisis and create welfare and jobs again.